Saritha has the experience in advising and handling a wide spectrum of dispute resolution such as shareholders disputes (minority oppression disputes and derivative actions), contractual disputes, defamation matters, arbitration involving construction disputes, landlord and tenant disputes, insolvency matters, forensic investigation involving the Malaysian Anti-Corruption Commission and Adjudication proceedings under the Construction Industry Payment and Adjudication Act 2012 (“CIPAA 2012”) are just a few examples of her work experience. 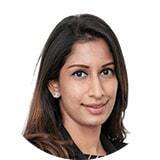 Saritha is also familiar with the PAM, KLRCA Rules of Arbitration, CIPAA 2012 and the CIPAA Rules, and has experience with conducting arbitration/adjudication under these Rules. Saritha represents and advises a wide range of clients (both local and foreign) in litigation and arbitration matters and has appeared in all levels of Courts in Malaysia including the Federal Court. Saritha chambered at Messrs Sivananthan and upon completion, took up the position of a Legal Assistant with Messrs Izral Partnership. Saritha joined the firm in 2009 and was made partner in January 2016.